If you have any questions about the MAIDOMO information page below please contact us. Originating from the Cnl (Cantieri Navali Lavagna Amy / Admiral Mariotti Yachts) yacht builder in Italy the MAIDOMO is 32 m 105 (ft) in length. Launched to celebration for 2007 the comparatively recent interior decoration proffers the contemporary perceptions in the designing of Luca Dini Design. Superyacht MAIDOMO can accommodate up to 8 passengers with 5 crew members. Her former names or project names are (Project A New Star). She is able to reach a high speed of 30 knots. Motor yacht MAIDOMO is a planning motor yacht built in aluminium alloy, powered with two MTU 16V 2000 M93, each of 2400 HP, and can achieve a max speed of 30 knots. MAIDOMO has a light blue grey hull. Her interior, consists of strongly contrasting colours including lacquered dark brown, opaque white and a prominent use of white marble 'crema luna' as decorative element. Cantieri Navali Lavagna (Cnl) was the naval architect involved in the formal superyacht plans for MAIDOMO. 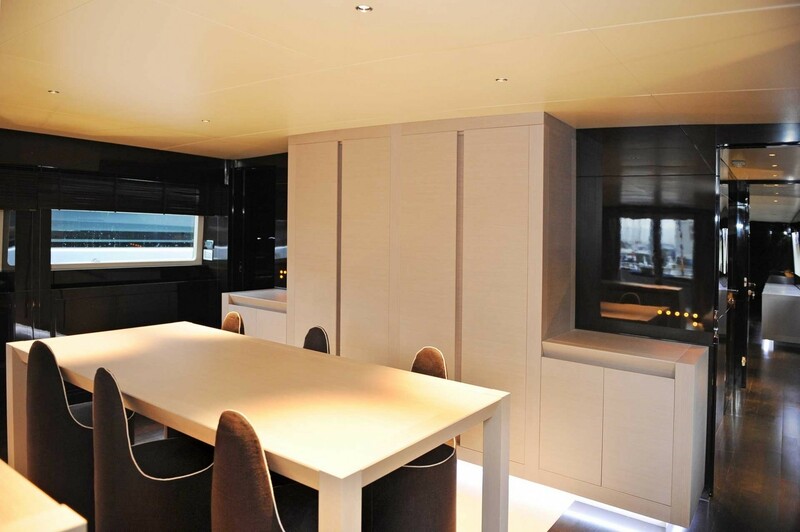 Also the company Cantieri Navali Lavagna (Cnl) and Luca Dini Design expertly worked on this project. Interior designer Luca Dini Design was commissioned for the internal internal styling. 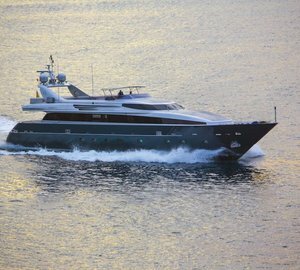 Built by Cnl (Cantieri Navali Lavagna Amy / Admiral Mariotti Yachts) this yacht was built within Italy. 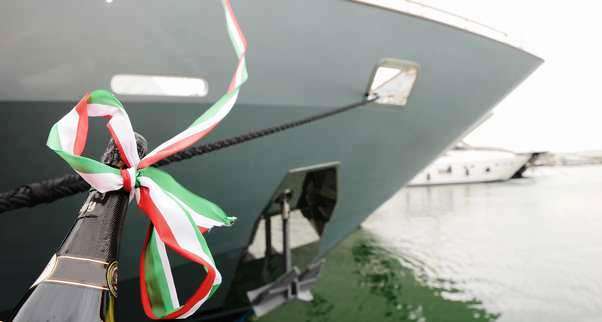 She was successfully launched in Lavagna in 2007 before being handed over to the owner. The main hull was constructed with aluminium. The motor yacht main superstructure is made largely from aluminium. With a width of 7.1 metres / 23.3 feet MAIDOMO has reasonable interior. A reasonably shallow draught of 2.5m (7.6ft) limits the amount of harbours she can visit, depending on their individual depth at low tide. The 16V 2000 M93 engine powering the yacht is produced by MTU. MAIDOMO is propelled by twin screw propellers. The main engine of the yacht produces 2400 horse power (or 1790 kilowatts). She is equiped with 2 engines. The combined output for the boat is accordingly 4800 HP / 3580 KW. 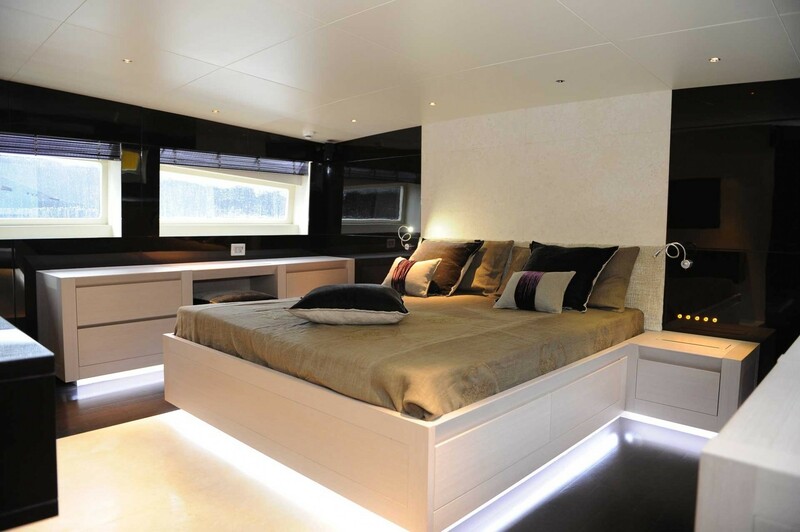 Having volume for a maximum of 8 yacht guests overnighting, the MAIDOMO accommodates everyone luxuriously. The boat utilises approximately 5 proficient yacht crew to run. 1000 at a speed of 27 knots. 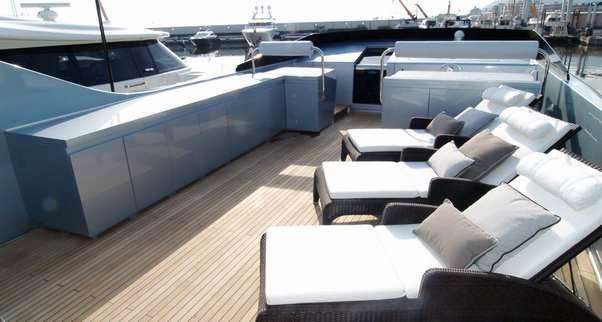 The luxury yacht MAIDOMO displayed on this page is merely informational and she is not necessarily available for yacht charter or for sale, nor is she represented or marketed in anyway by CharterWorld. This web page and the superyacht information contained herein is not contractual. All yacht specifications and informations are displayed in good faith but CharterWorld does not warrant or assume any legal liability or responsibility for the current accuracy, completeness, validity, or usefulness of any superyacht information and/or images displayed. All boat information is subject to change without prior notice and may not be current.